Would you consider yourself a grill master? Do you enjoy spending the weekend grilling your favorite meats? If so, you are probably interested in meat smoking as well. Smoking meat is a slow process in which low temperatures are used to tenderize meat and add intense flavor. And, we know you take grilling and smoking seriously, so it’s not a bad idea to learn about the best meats for smoking. Then, you can impress everyone in the neighborhood with your smoking skills. Below are a few examples of the best meats for smoking, whether you are a beginner or a master smoker. Ribs are one of the most commonly grilled foods and a popular choice for smoking. That’s because they are easily-smoked and actually taste better with the slow cooking process. In fact, smoking ribs make them more tender and mouth-watering than any other way of cooking them. Most importantly, you will need to choose a quality slab of beef ribs that have good meat coverage over the bones. You want to avoid large areas of fat. Unlike other meats, fat does not play a factor in the overall taste of ribs. The five main cuts of ribs are baby back, county style, spare, beef back and short ribs. Look over the selection of ribs at your local meat department and choose a slab with thick meat and less fat. To prepare the ribs, you will need to remove the membrane and then rub on a seasoning. Once your ribs are prepared, place them on the smoker, and in no time you will have freshly smoked ribs! Another great option for smoking is wings. An affordable and tasty option, wings can be smoked in a variety of ways. You can use a sauce rub or dry seasoning. Just take your pick or do a mix of both! Wings are quite affordable and will not take as long to cook as larger, thicker meats. There is no special secret to choosing wings as all types are tasty. Try a variety of rubs every time you smoke wings to find your favorite! One of the best meats for smoking is beef brisket. This cut is taken from the chest of a cow. When choosing a brisket, it is important to make sure that the meat has a fatty layer and marbling. This will guarantee that the brisket has massive flavor when smoking. When shopping, look for a piece that has a nice fatty layer and is tender. We recommend asking your butcher to provide a tender piece of meat. The more flexibility the piece has before cooking, the more tender the meat will be once finished. For a good smoking brisket, you want to purchase a piece that is untrimmed and undivided. You can request a “packer’s cut” which will ensure that the piece has a fat strip in the middle and another layer on top of the meat. You will need to rinse the meat and allow it to marinate for 12 hours to ensure quality flavor before smoking. Brisket is often prepared with a rub or a sauce to make a crisp layer over the meat. Further, as smoking is always done on slow heat, brisket is also smoked over slow heat to maintain the juiciness, richness and buttery texture of the meat. Pork is a meat type that is wonderful for smoking in many forms. One of the most popular forms is a pork shoulder. The pork shoulder is a good choice because it has a nice ratio of fat to lean meat. This simply means it will cook well during slow smoking, and remain moist as well as full of flavor. You can also end up with pulled pork because the meat is very tender once cooked. Make sandwiches, tacos and more by using the pork shoulder for cooking. To choose the right meat, look for one with the bone-in to add flavor during cooking. You need a good ¼ inch of fat on the meat to ensure flavor. Now that you know all about the best meats for smoking, you may be interested to learn about the science behind smoking meat. 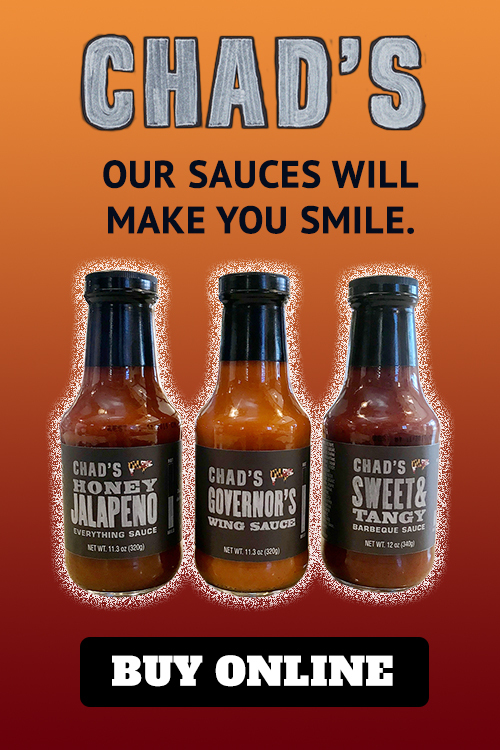 Or, if you rather, you can always stop into Chad’s and check out our menu. If you are interested in learning how to smoke meat on electric smokers, we suggest you visit Ted’s blog which is all about electric smokers – ElectricSmokerGuy.com.